Is Indonesia an Unusual Muslim Country? I’m currently finishing up the first draft of a book manuscript on Islam and political economy in Indonesia. One of the arguments that I aim to make is that an intense study of the Indonesian case is broadly relevant for the study of Islam and political economy everywhere. But like many who work on Indonesia, I often find that scholars of Islam are skeptical that the Indonesian case has much relevance for them. Indonesia is often viewed as simply too different: not just at the far southeastern corner of the Muslim world, but characterized by a fundamentally different politics, economy, society, and history. I aim to challenge that view. But while readers some may be convinced by my appeal to history, many will not be. Skeptics of the relevance of Indonesia will look at the rest of the Muslim world, and say “it’s the only democracy,” or “it’s so large,” or “it’s so diverse.” These things are true, at least right now. But there are probably hundreds of other dimensions along which one might compare Muslim countries. Is Indonesia extreme along all of them? Hard to say without cherry-picking examples. So I’ve developed a more formal statistical test of the uniqueness of Indonesia vis-a-vis the rest of the Muslim world. To do this, I’ve used the handy QoG dataset from the Quality of Government Institute at Gothenburg. This contains hundreds of variables capturing everything from GDP to ethnolinguistic fractionalization to civil liberties to violence. I’ve taken their time-series-cross-section dataset, dropped all countries that are not majority or plurality Muslim, and then created a country average for each variable. Then, for each country, I’ve calculated what decile it falls in for each variable in the dataset from among all 52 Muslim majority and Muslim plurality countries. So, for example, if country A scores on the 95% percentile of all Muslim countries for variable X, it gets a score of 10 because it’s in the 10th decile. Repeat that for every ordinal, continuous, or dummy variable in the dataset, and the result is a series of decile scores for each Muslim country for hundreds of variables. The intuition here is that if a country is “abnormal” or “unusual” it will tend to score on the extremes—1st or 2nd, 9th or 10th deciles—for lots of variables. “Usual” countries will tend to score in the middle. Examine the distribution of scores for each of the 52 Muslim countries, and you can start to see what Muslim countries are normal and which ones are not. Here is what this looks like. 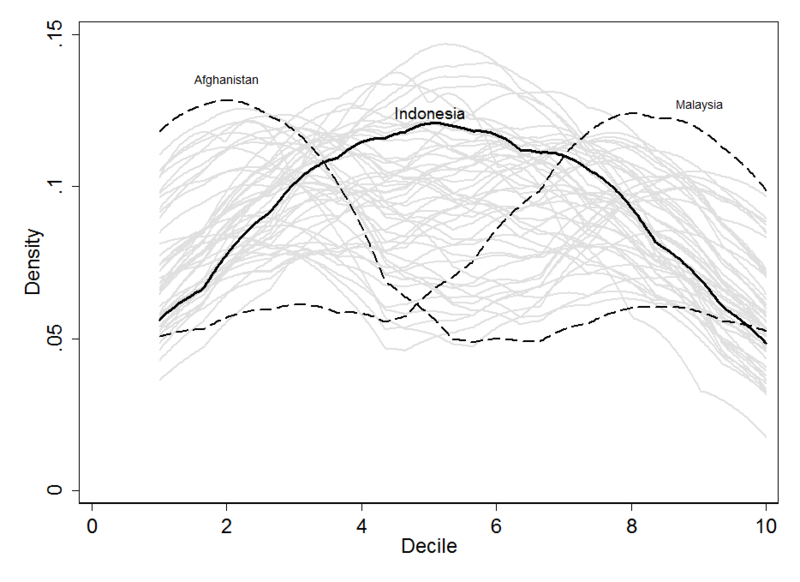 Each gray line represents a kernel density plot for one country’s decile scores. Indonesia’s is the thick black line. So there’s my answer: across most indicators that we can observe, Indonesia is a typical Muslim country. This does not entail that Indonesian Islam is typical as well. But it does suggest that even if Indonesian Islam is atypical, such differences haven’t translated into broad differences in economy, society, and politics.